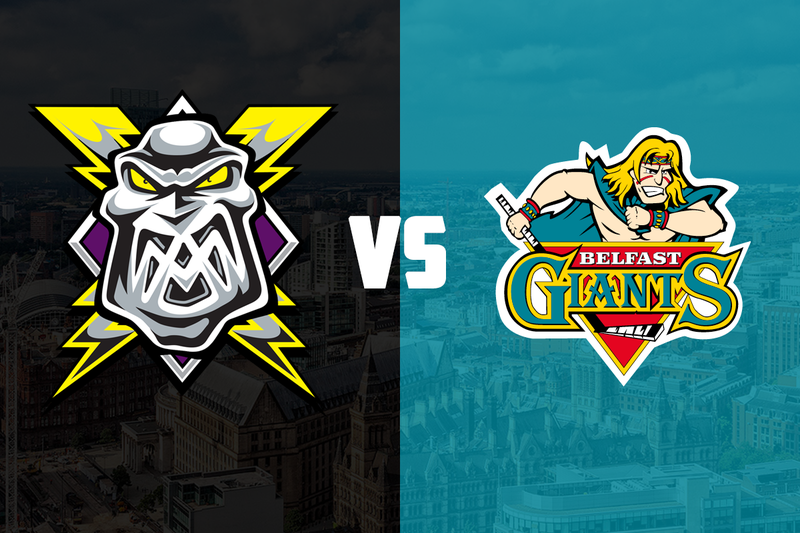 TICKETS: The Go Goodwin’s Manchester Storm welcome the Belfast Giants on Saturday the 9th December here at Planet Ice Altrincham! Tickets can be ordered online, by calling the box office on 0161 926 8782, or in person at the box office. Your Go Goodwins sponsored Manchester Storm are back in Elite League action this Saturday as the Belfast Giants travel to the Storm Shelter in a 7:00 pm faceoff. It’s tight at the top: With the season about one third of the way through, the table is looking very tight. Only 12 points separate Nottingham in first and Coventry in tenth, with the Storm sitting in fifth, equal on points with Sheffield and Cardiff above them, prior to the weekend’s action. Belfast are two points ahead of this pack in second, with 29 points from 23 games, Storm’s 27 points coming from 20 games. Looking in the other direction, an in-form Guildford side are hot on the heels of the top five just two points adrift, while Fife are a further point behind but have only played 18 games. With such a tight table, every game becomes important to ensure teams don’t slip down the league standings. Last weekend: Belfast went into last weekend on a 4-game winning streak, which continued on Saturday night as they overcame the Milton Keynes Lightning 6-3 away from home. It was a big night for Steve Saviano, who scored two and assisted on a further goal, as well as Darcy Murphy who also grabbed two goals. Brendan Connolly and Colin Shields scoring the other two. This was followed up by a feisty game in Guildford on Sunday night, where the Giants went down 5-3. Goals from Murphy, Connolly, and David Rutherford were not enough to secure the points for the Giants. Storm secured a 3-point weekend, with games against Cardiff and Coventry. The Devils travelled to Altrincham on Saturday night for a game that see-sawed one way and then the other. Dane Byers getting the scoring underway in the first, before two powerplay goals for the Devils saw them enter the intermission 2-1 ahead. A Paul Swindlehurst goal, his ninth league goal for the Storm, set the game up for a tense finish as the teams traded goals with only a handful of minutes left to take the game to overtime, during which the Devils secured the victory. Storm then travelled to Coventry on Sunday night, and overcame the Blaze 4-2 in regulation. Scott Pitt, Ciaran Long, Luke Moffatt, and Mike Hammond scoring the Storm goals, while Mike Clemente turned away 39 shots in nets. Previous meetings: It was a game to forget for the Storm last time the sides met, as the Giants won the game 9-3 in the SSE Arena. Steve Saviano was the star on that night, with 6 points overall. Prior to that game, the sides met in Altrincham in early October in a game that ended 2-1 in favour of the Storm. Jay Rosehill and Paul Swindlehurst getting the Storm goals. One to watch: Steve Saviano has been picking up the points recently after a bit of a slow start, and is currently the Giants’ fourth top points scorer. Saviano returned after his first season at the Giants, during which he scored 46 points in 52 games.